Rushden Research Group: Transport - Birch Bros. I must have been one of the most regular London to Rushden passengers back in the early nineteen fifties. My parents had moved to Swiss Cottage in north London and as all my relatives lived in the Rushden/Raunds areas we visited them often. My father had no car and the train journey meant a change at Wellingborough so our normal mode of transport was the Birch Bros bus. We made the short trip to King’s Cross by London transport to catch the 203 from there to Rushden. Next to the bus stop was a ‘greasy spoon’ café where in cold or rainy weather we waited until it was time to go. The green and cream double decker was normally punctual and had a driver and a conductor much like the London buses. I think they ran once an hour and the journey took three which was a long time in a vehicle with dubious comfort and heating. It was usually my mother’s job to keep me entertained, not an easy task I can assure you. Once we left King’s Cross the journey took us through North London, via Highgate and under the famous ‘Archway’ and on towards North Finchley. There were several pickup points on the way where we took on more passengers. 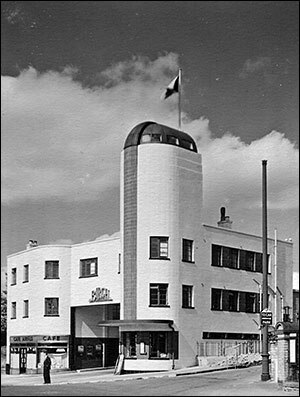 Then, it was out into the countryside through Barnet, Potters Bar, past the ‘Black Cat’ cigarette factory, Hatfield, Welwyn Garden City, Codicote, St. Ippolytts and Hitchin. Those names are indelibly printed in my memory, we passed through them so many times. At Hitchin there was a short comfort stop but we never left the bus as I think my mother was always afraid it would leave without us. Once in the rural areas we stopped many times at both designated and undesignated stops. It always amazed me how the driver would pull up to let people off or pick them up near their homes or close to wherever they were going; a thing unheard of in London. After Hitchin familiar place names are Henlow, Shefford, Cotton End and Cardington and the giant airship hangars where the R1O1 and other airships were built. Their size never failed to set my imagination going and I would have loved to have gone inside one of them. Then it was into Bedford where, even in those days, the busy traffic slowed us up to a chug through the town. The last twelve miles to Rushden always seemed the longest part of the journey but as we passed the ‘abattoir’ sign just over the town boundary I knew we would soon be in the High Street and it would be time to get off and stretch our legs at last as we walked up to Portland Road to my grandmother’s. Sometimes we would be going straight on to my grandfather’s in Raunds which meant yet another bus trip but that story can wait for another day. In 1959 the first part of the Ml was finished and Birch Bros opened a new route using the motorway. My mother and I were on the first ‘coach’ the 203M and the journey passed very quickly as we sped up the new road coming off at Flitwick. After a few miles the driver pulled into a lay-by and announced that he was lost! Nobody on the coach knew where we were and so we all looked at the road map he had and tried to work out where we could be. After some moments we decided we must be going in the right direction and we should carry on until we saw a signpost and hopefully we would be able to get back on the right track. At the next crossroads there was a sign that said Bedford so we were saved and got to Rushden with no more problems. In the sixties I bought a car and that was the end of my Birch Bros experiences and of an era. The journey then took only an hour which was certainly an improvement but I still remember those trips and the garage in Rushden, now only a shadow of its former magnificent self. 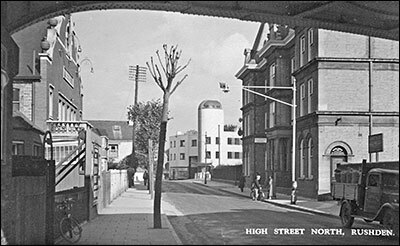 Picture of Birch Bros bus garage c1950 taken from underneath the railway bridge, since demolished. The building is now used as a Chinese takeaway and a furniture shop.